CLPA is proud to issue the CLPA Newsletter to public. 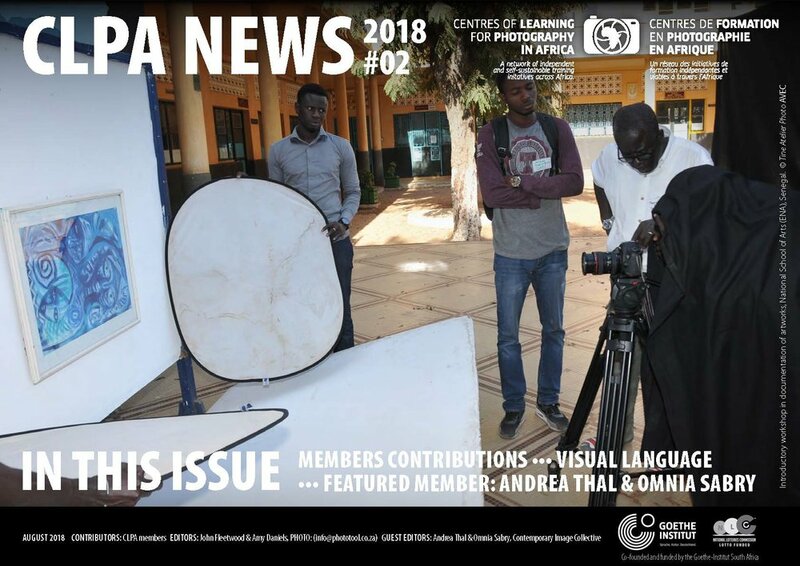 The CLPA (Centres of Learning for Photography in Africa) newsletter was established in 2016: initially a closed newsletter for network members to keep abreast with photography education related activities and developments across Africa. Photo: currently spearheads the CLPA newsletter as the main editor with rotating guest editors from CLPA’s member institutions. The newsletter features individual members’ thoughts around their work, their role as educators and practicing photographers, as well as reflections on the state and role of photography on the continent and beyond. CLPA is a network of photography education institutions and educators from Egypt, Ethiopia, Mali, Nigeria, Rwanda, Senegal, South Africa and Sudan. CLPA was initiated in 2014 with the aim to contribute to the professionalism of African photography and to ensure future generations of skilled and conscious African photographers. CLPA is primarily committed to strengthening and promoting photography education on the African continent. Past CLPA activities include a network meeting in Johannesburg, 2015, for teacher training, project management training and a curriculum development workshop. In the same year, CLPA ran a public forum as part of the official program for the 10th edition of Bamako Encounters, Mali: ‘The state and the future of photography training in Africa’ (2015). In 2016, CLPA hosted a public forum as part of Lagos Photo Festival, Lagos: ‘African Knowledge Production through Photography and Interdisciplinary Artistic Practice’. In 2016., Photo: initiated a Survey of Photography Training and Learning Initiatives on the African Continent , a survey and mapping project for photography schools on the continent. The project was supported by Goethe Institut, Johannesburg and continues to be developed by Photo:. CLPA is based on the premise that the exchange of ideas and solutions between organisations, who share the same goal and ambitions, is a sustainable way of improving the photography education landscape on the continent.Currently,CLPA members are working actively towards the realisation of exciting new initiatives, including: Pan-African Photography Workshop exchanges, a CLPA Digital Knowledge Sharing Hub and a Mobility Residency Network. Since 2016, CLPA has issued 8 newsletters, which now available to public. The CLPA Newsletter editions are issued in English and French. CLPA is a closed membership. The CLPA Newsletter is supported by the Goethe Institut, Johannesburg and Photography Education Trust through the National Lotteries Commission.